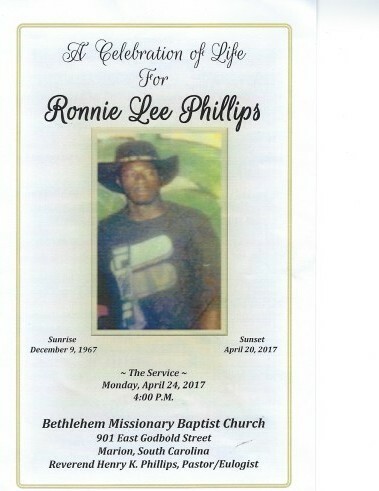 Ronnie Lee Phillips was born on December 9, 1967 in Marion County, SC to Alice Phillips and the late Levern Phillips, Sr. He departed this earthly life to be with the Lord on Thursday, April, 20 2017. He was educated in the Marion County School system. Ronnie Lee inspired may lives with his great sense of humor and generosity. He worked with the City of Marion and set his sights high on cutting trees. Some of Ronnie's quotes: "Boss of Hugo," Ronnie value Vonta don't need no money." Ronnie had two brothers whom preceded him in death: Liston Phillips and Kenneth Phillips. Ronnie leaves to cherish his loving memories ~ his mother: Alice Phillips; three sisters: Janice Phillips, Mary "Evon" Phillips and Patricia Jones; five brothers: Levern (Patricia) Phillips Jr., Larry (Connie) Phillips, Carl Phillips, Jerome Phillips, Julius (Tereasa) Phillips all of Marion, SC; a special companionship and caregivers; Jakarri Phillips, Lawrence Williams, James Ransom, Michael Askins, Kendra Williams, Regina McZeak, Marvon "Don Don," Tony Phillips, Michael Phillips, Hope Phillips, Tyrell Phillips, Timothy Britt, Quinton Adams and a host of nieces, nephews, other relatives and friends.